Looking for the lowest prices on gout medications? You can order Colchicine generic at best price through CanadaPharmacyOnline.com. We currently have the generic Colchicine 0.5 mg also known as Kolsin from Turkey manufactured by I.E. Ulagay, generic Colchicine 0.6 mg comes from Canada and is made by Odan or Jamp Pharma. We sometimes stock generic Colchicine from other manufacturers around the world, including Zycolchin by Zydus in India. The brand Colcrys is currently not available. 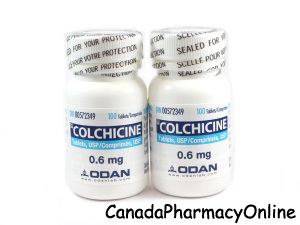 Purchase Colchicine through our mail order Canadian Internet Pharmacy in the strengths of 0.5mg and 0.6mg tablets, you can pay by Visa, MasterCard, Checks, and Money Orders. Colcrys (Colchicine) is the most popular oral gout medication. This medication is used to treat gout and prevent frequently occurring attacks of gout. It may also be used to treat familial Mediterranean fever (FMF). Colchicine works by reducing the swelling, inflammation, and pain that occurs when uric acid crystals form in the joints. In acute gout there is severe inflammation in response to the presence of uric acid crystals that form in the bony joints. This medication suppresses the inflammation caused by gout. Although the exact mechanism of this medication is not known, it is theorized that it reduces the crystallization of uric acid. Changing your diet and healthy lifestyle choices can prevent gout and reduce the risk of gout attacks. You should not use Colcrys if you are allergic to Colchicine. Before you start taking this medication, inform your doctor about your medical conditions and about all the medications you are currently taking including OTC and herbal medications. This medication is only for adult patients with gouty arthritis. It should not be taken by children with Mediterranean fever who are under 4 years old. It is unknown whether Colcrys will harm an unborn baby. It is not known whether Colchicine passes into breast milk or if it could harm a nursing baby. Talk to your doctor if you are pregnant or breast-feeding. 1. What can I eat to prevent and help ease gout? Answer: You should avoid alcohol, caffeine, processed food, red meat, poultry, and sweetened food and cut back on fat. The top foods to eat for gout prevention are low-fat dairy products, filtered water, dark berries, vitamin C fruits and fresh vegetables. Eating foods rich in omega-3, cherries, cheery juice, pineapples can greatly help ease gout pain. 2. What other medical conditions are linked to gout? Answer: High uric acid levels are linked to hypertension, diabetes, high cholesterol levels, and obesity. Treating these conditions may improve gout. Can an App A Day Keep the Doctor Away?